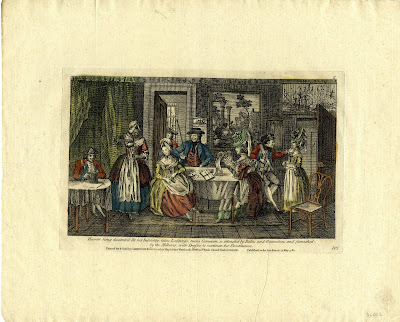 The modern harlot's progress, or adventures of Harriet Heedless / Harriet being discarded for her infidelity, takes lodgings, turns common, is attended by rakes and gamesters, and furnished by the millener, with dresses to continue her prostitution, Carington Bowles, 15 May 1780, British Museum. This plate was taken from a book warning of a fall into immorality. Such novels were salacious and popular, widely imitated in art and literature throughout the late eighteenth century. 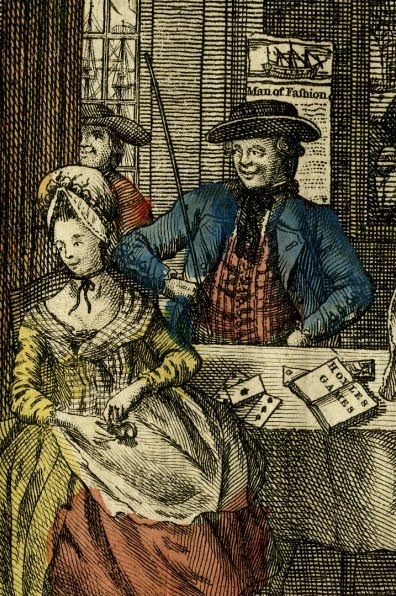 In this image, Harriet Heedless (seated with a snuff box by an open hand of cards across the table from a sailor) has joined a bawdy house. He wears a black round hat with an upturned brim bound in white tape. His neckcloth is black and is tried in a right fashionable way, with a large bow right at his neck. Jack also wears a red waistcoat with vertical stripes, though the colorist did not bother to differentiate the color of the stripe from the body of the fabric. His double breasted jacket is interesting in that the cuffs are buttoned right at the wrist, but otherwise open to reveal the shirt beneath; something I've not seen before. The upper part of his jacket lapels are buttoned back. In our tar's right hand is a long and narrow walking stick.